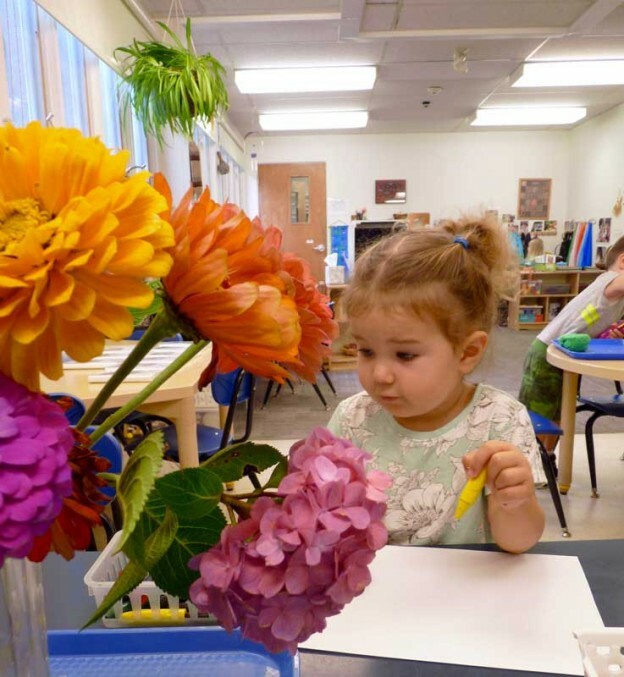 At Learning Circle Preschool, we teachers are very interested in discovering ways to encourage children to develop their capacity to take time to look at the world carefully, investigate, and document what they see, think about, or feel. We may share our own observations as we join children in theirs, encouraging conversation and shared perspectives. We offer a variety of materials in the classroom and outdoors that we hope will inspire children to take some time to investigate on their own or with other children. And we introduce a variety of media and tools that over time we hope children will learn to use to document their observations and their understanding about what they experience. We’ve just completed our second week of school, and this process is well under way in each classroom. We’ve watched children in their second or third year at Learning Circle begin to apply their past experiences with these approaches and tools to represent their current understanding and interests. And it hasn’t taken long for children new to these approaches to join in. Children have investigated different types of heirloom tomatoes, comparing size, weight, color, and shape together in small and larger group meeting discussions, and then spent time with magnifiers and drawing tools to record their observations. Others have talked together about the parts of plants as they observe fall flowers, and draw or paint details and colors as they talk with teachers about their observations. Outdoors, children find a variety of leaves and seeds, and spend time drawing them. Children observe a crab in our saltwater tank, and draw details of what they see. A few children with a keen interest in ocean life used books to research and talk about sea life, and then spontaneously painted important details of those animals at the easel. And some children have begun the process of thinking about their own play through drawing, as they document their processes and ideas after constructing with blocks. We teachers work hard to create an environment in which children will find the rich materials I’ve mentioned, among many others, and feel the freedom to experience these materials directly, making their own connections, drawing on their previous experiences, to learn about nature and themselves in a deep way. This entry was posted in Curriculum, Education on September 24, 2016 by Katrina Selawsky.